This newly renovated 4th floor condo has new living room furniture including a queen size comfortable sofa sleeper, luxurious pillow top queen size mattress in the bedroom and brand new mattresses for the bunk beds. New towels, linens, paint, and was just deep cleaned. This unit is fresh and comfortable. This home is complemented by stunning floor to ceiling windows in this spectacular 1 bedroom condo. Carefully selected accent pieces are found throughout for a stylish and coastal feel. There is plenty of living space with comfortable seating and multiple dining areas. A fully equipped kitchen includes plenty of cookware and utensils for at home convenience during your stay. Relax at the end of the day as you lounge and watch the sunset from your furnished private balcony! This luxurious 4th floor vacation home will accommodate a total of 6 guests. *This resort requires the PRIMARY RENTER to be at least 25 years of age and primary renter must remain on property the duration of the visit. PLEASE READ: The Boardwalk Beach Resort Community Association, Inc.’s beautification project will continue until June 17, 2019. The Balcony for unit 407 has the potential to be affected between December 27th and February 28th. While the interior of your condo will be accessible at all times during the project, condo balconies may be inaccessible during the resurfacing and painting. Some guests may also encounter common area closures or restricted access plus construction noise. • Master Bedroom with luxury pillow top queen sized Bed. • Twin Sized Bunk Beds with new mattresses. Boardwalk Beach Resort is situated directly on the beach and offers a tremendous strip of private beach for guests to enjoy. This 22 story Gulf Front condominium is located in the heart of Panama City Beach. The resort is surrounded by restaurants, golf, nightlife, shopping and family attractions. In keeping with a sensational reputation, Boardwalk features an endless variety of amenities and extravagances to ensure an unforgettable visit. Located steps from dining, shopping, and the famous night clubs, Spinnaker and La Vela. Boardwalk Beach Resort in Panama City Beach, Florida is a family friendly resort offering all the amenities one would expect to compliment a family beach vacation. 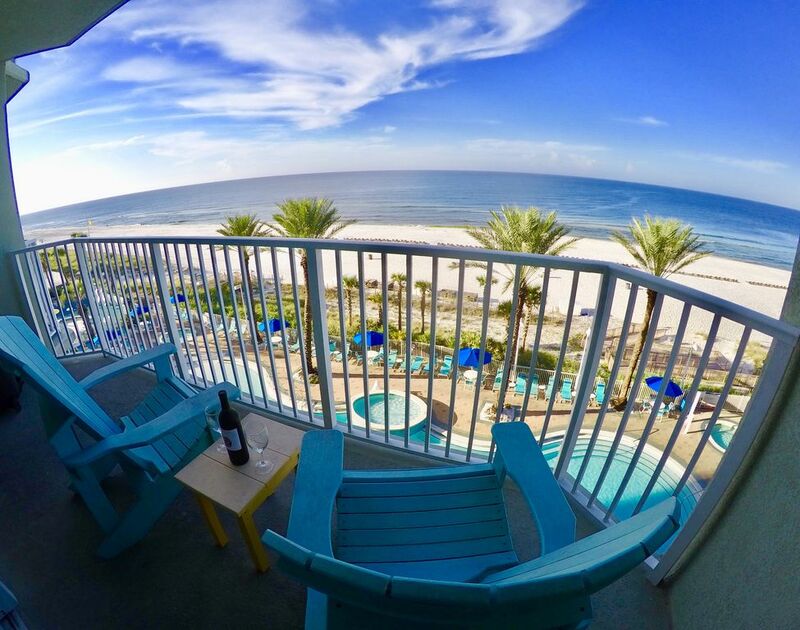 It's hard to imagine a more perfect vacation when you stay at Boardwalk Beach Resort situated directly on the Gulf of Mexico in Panama City Beach. You'll enjoy breathtaking views from this 4th floor unit. Boardwalk Beach Resort boasts lush, tropical gulf view pools (heated seasonally), barbecue area and covered parking. Boardwalk Beach Resort is located on the east end of Panama City Beach, near the entertainment and shopping district. Boardwalk Beach Resort is a true beach escape. This beachfront condo is in the center of the building and located on the 4th floor. Unit 407 boasts spectacular beach and sunset views. Resort is located on one of the largest private local beaches. New 55inch Flat screen in Living room and flat screen in bedroom. enjoy sunsets from your balcony.